This chart shows the National Internet Diversity at the International Frontier. The Internet is supposed to be a distributed architecture, designed to withstand large-scale attacks. The decentralised nature of the Web allows for systems to be taken out, while the whole still will operate by redirecting traffic through the remaining nodes. This makes the Internet resilient to random attacks. A country is classified as being at severe risk of Internet disconnection if it has only 1 or 2 companies at the international frontier. Significant risk if less than 10 operators. Low risk when a country has from 10 to 40 companies. Finally, if a country has more than 40 companies it is then likely to be extremely resistant to Internet disconnection. 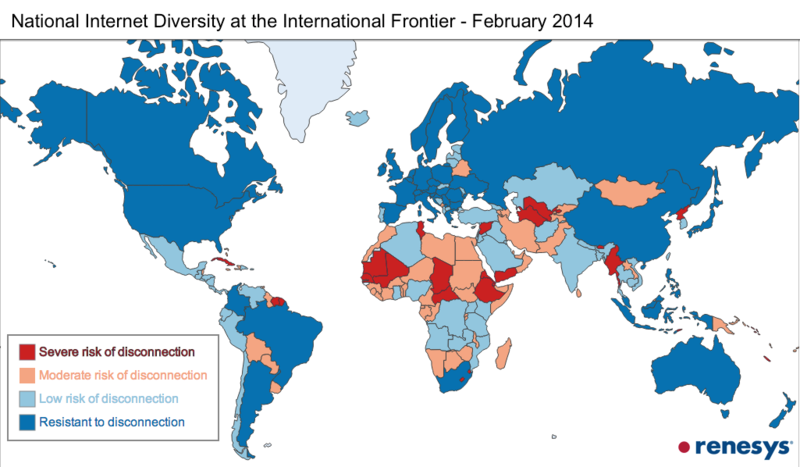 National Internet Diversity at the International Frontier, Dyn Research, viewed 11th February, 2016, <http://cdn3.vox-cdn.com/assets/4464711/world-2014.png>. National Internet Diversity at the International Frontier, ChartsBin.com, viewed 20th April, 2019, <http://chartsbin.com/view/39038>.